The impressive Ocean Splendour villa, in the heart of Albion have a rear garden together with a breathtaking view of the ocean at the front. Whilst relaxing on the tranquillity of the terrace over a favourite beverage, and if you are lucky enough you can take pleasure in watching families of dolphin at play during their dawn adventure. The enclosed swimming pool, which was design for the security of children together with deckchairs and a kiosk to keep in the shade, provides the kind of atmosphere that allows you to maximise your stay and rest away from the hustle and bustle of everyday life routine. Whether you are with friends, family or loved ones each bedroom gives you maximum privacy together with en-suite bathroom. Two out of the four double bedrooms have panoramic view of the azure ocean together with a balcony that will leave a lasting impression on your stay. For added comfort each bedroom also benefit from timed air conditioning. A safe is available to store those valuable items. I was born and grew up in Mauritius until the age of 6. My family then moved to England and have resided there ever since. I frequently return to Mauritius to managed the care and maintenance of the villa. My main interest is also the social contact between friends and families. My general interest also include the island progression as a tourist destination as well as the economy and politics. The land has been in this family for decades before I decided to build a dream home where my family and I can enjoy. As retirement is not yet on the horizon I made the decision to rent it out and hoped that our customers can benefit and enjoy this peaceful location as much as we do. The unique benefit for me is the peace and stillness that the location offers. Sitting outside on the terrace in the morning is one of the dreams that I will always treasure. exactly as advertised. Spotlessly clean. Wonderful pool and beautiful house. Lovely views. Everything was wonderful. We were really well looked after by Antoine and Jennifer. We have no complaints only praise for a really excellent holiday in Mauritius. The villa and pool were exactly what we wanted for a relaxing holiday. We went on day trips, with Bim driving us around and also at nights when we went out for dinner. Jennifer did all the cleaning and laundry and cooked wonderful meals for us when required. Antoine was really kind and helpful and made our stay easy and enjoyable. Highly reccommended. We were a family of 9 and stayed at the Villa for 12 nights. 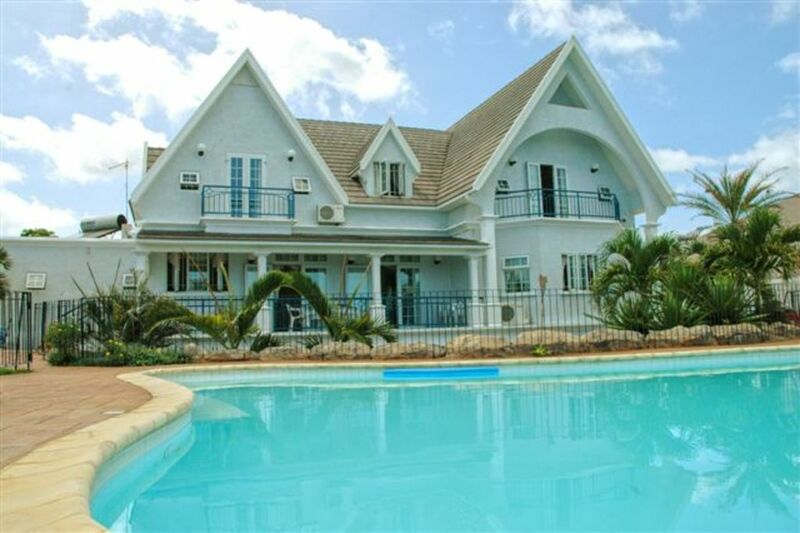 It is a beautiful well maintained villa and perfectly located to visit most places of interest and the most amazing beaches in Mauritius. It is close to Flic en Flac where you will find the restaurant Domaine Anna, a definite place to go and eat. Casela Nature Park is about 15 minutes drive as well as a shopping center called Cascavelle that has an amazing bakery called "The Bakery". Many a time we stopped there for fresh bread and a cappuccino. Another place to go and visit is "Dodo Quest" in Moka which is a game involving clues etc to get out of a locked room in 59 minutes. We thoroughly enjoyed doing that. The villa is well equipped and has everything you need for a comfortable stay.We thoroughly enjoyed the pool area that overlooks a rocky beach while sipping cocktails and watching the most amazing sunsets. We will definitely come back to this place and we will recommend it to our family and friends. Renting a car is well recommended as it is a bit of a walk to get to the public beach or nearest supermarket. Overall a wonderful stay and we were very sorry to leave. Beautiful people and island i enjoyed my stay more than Imagined the villa was exactly like the picture and more.. antoine was superb in helping us and jennifer was a pleasure to make us feel welcome. I would definitely be staying again a little advice is to drive to explore the island more location peaceful quiet thank you soo much antoinne also martine for easy peace of mind to stay x I will definitely try to come again next year! We - 2 German families, 4 adults and 4 kids age 10-12 - spent 2 1/2 wonderful weeks at the Ocean Splendor Villa - we enjoyed ourselves very much having this great villa as starting point for all our excursions. The description is fully accurate - it is a very spacious villa, with great big rooms. From the balconies and the terrace, there is a stunning view over the pool and the ocean - breathtaking during sunset. We all loved the great huge pool, especially beautifull due to the rocks and waterfall, and the kids used the rocks outside the garden as their playground. It is very advisable to have a car, when booking this villa. Everything was great here - especially Rosemarie and Jean have been the perfect help in this holiday. Rosemarie has kept the house spotlessly clean and has continued to provide us with fresh linen and towels throughout our stay. In addition, she even managed to wash and iron part of our laundry, which was so very kind of her. Jean has been wonderful - keeping the pool clean for us every day, helping with any questions, bringing breakfast every morning, organizing lobsters from a friend, and even tkaing me and my daughter to his family to get a hair-do. Last, but certainly not least, we also want to mention Jennifer. We had hired her to prepare dinner for us, so that we did not have to stand in the kitchen after our trips. It was always great, and we enjoyed it every evening. She even organized a wonderful birthday cake. One small suggestion: as we were not using the aircon, we did have a lot of unwanted visitors (=moskitos) at night. Moskito screens in the bedrooms would help with this a lot - insect repellent helped us in the meantime. We would certainly recommend this villa to everybody. Nous avons passé deux semaines merveilleuses dans cette villa. Tout était absolument parfait. La villa était exactement comme décrite dans l'annonce. Le personnel était d'une gentillesse et d'une compétence extrême et a beaucoup contribué à la réussite de ce séjour. Tout s'est passé à merveille, les enfants étaient enchantés. Nous recommandons cette villa à nos amis et à nos proches. Mais surtout, nous espérons y revenir nous même un jour. Transfers to and from the airport worked well. We didn't have any hanging around. Jean and Rosemarie looked after us well during our stay without being intrusive. On the day we arrived, Jean even got in our hire car with us and directed us to the supermarket. We found Winners was the best supermarket, which is about a 10-15 min drive away, towards Flic en Flac. For restaurants, we enjoyed Robinsons which is a 5 minute drive, Casa Nostre in Tamarin, which does nice pizzas and Pepes in Flic en Flac which is approx 20 mins drive. For a nice lunch with great views try Chamarel Restaurant in Chamarel. I would definitely recommend car hire if staying at this villa but we enjoyed the peace and quiet of the location. One thing that would have helped us was if the guest book was kept in the villa rather than being presented on the last day. That way we could have seen what restaurants and sights other people recommend. Overall we had a great holiday and the villa was lovely. The villa is only a few minutes away from the newly opened 5 star Club Med resorts. It is well situated within reached of the capital Port Louis and other major shopping centre towns such as Beau Bassin, Rose Hill, Quatres Bornes and Casela the famous bird and other wild life sanctuary.